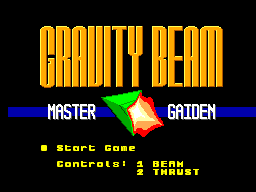 Gravity Beam: Master Gaiden is a new game for the Sega Master System. It is the 33rd century. Humanity continues its colonisation of the Red Planet, Mars. Colonists and miners have worked tirelessly for many years, excavating caverns of unimaginable scope throughout the core of the planet in search of elusive subterranean minerals. This devastating work is viewed with contempt by many fringe groups in colonised space. Private security and intelligence forces are stretched to breaking point protecting those trying to tame the Red Planet. One group in particular, claiming to be allies of the 'guardian daimon' of Mars, have struck many savage blows against the colonisation effort, attacking mining facilities, dormitories, miners, engineers, scientists and their families indiscriminately. They claim that the colonisation efforts are causing irreparable damage to the natural ecosystem of Mars, and demand that humanity leave at once. Admist all this madness, a terrorist cell activates after a decade-long infiltration into the heart of colonial governance. They take a number of key colonisation personnel hostage. Their demand: the absolute abandonment of Mars by the human race within twenty-four Earth hours. "You may think you have won, but you can -never- win. We have planted a nuclear device in the heart of Mars. A device capable of annihilating the entire planet." You are an ace pilot. The best. Your trusty ship, the Greenwing, is equipped with a state of the art Gravity BeamTM, capable of hauling any cargo through the most treacherous terrain. You've never had to carry a nuclear bomb before, but how dangerous can it be? 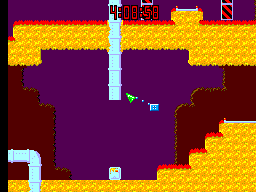 Negotiate the caverns of Mars and locate the nuclear device. Engage your ship's GRAVITY BEAM to attach the device to your ship. GOOD LUCK, pilot. And GODSPEED. For the best game play, learn the different button functions before you start. On the main menu, press up or down to navigate the menu options. In-game, press right or left to rotate your ship clockwise or counter-clockwise. On the main menu, press Button 1 to select menu items. 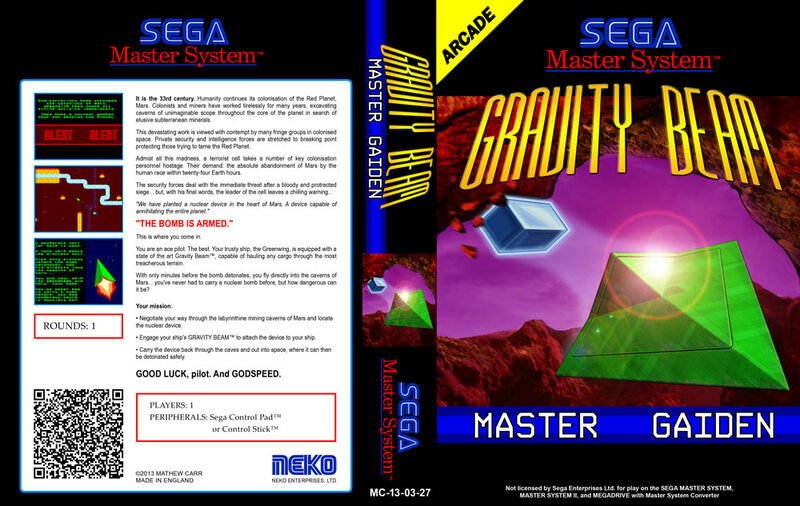 In-game, press Button 1 to engage or disengage the Gravity Beam when in range of the crate. Press and hold Button 2 to engage thrusters and move your ship in its current direction. The function of Button 1 and 2 can be swapped on the main menu. In-game, press to pause the game; press again to resume play. Move slowly: the bomb is fragile! Allowing the bomb to collide with the cave walls will damage it! When the box starts blinking, you know you're in trouble. The box will blink faster the more it is damaged. If the bomb incurs enough damage, it will explode! Even getting it caught on something may be enough to destroy it. If the box gets stuck, detach from it immediately! Remember your mission: don't place the box on the landing pad! We don't want it!! You have to drag it out into space. 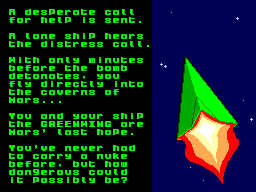 To do this, fly your ship out of the caves through the opening at the top of the screen near the starting position while the Gravity Beam is engaged. The Gravity Beam has a maximum distance before engagement. You can only engage the beam if you're within about four ships' length of the box. The Gravity Beam has a maximum length during engagement. If the box swings too far away from your ship, the Gravity Beam will be disabled and the box will go flying across the landscape. The box is pretty heavy; if you're moving at speed and you make a sharp turn, the box might drag you into danger! Your ship is indestructible, as are the cave walls. Colliding with the walls brings your ship to a dead stop. Use this to your advantage. The box falls rather slowly through open space. While you're attached to the box, you will see a dotted line between the Greenwing and the box. Game design and programming by Mathew Carr. Music and sound design by Mathew Carr. Compression tools by Mathew Carr. Music and sfx player and module conversion tools by Mathew Carr. Cover planning by Mathew Carr. Cover Greenwing illustration by Jonathon Carr. Tiled Map Editor (mapeditor.org) was used to create the levels. Written in Z80 assembler. Assembled using WLA Z80 Macro Assembler v9.5, written by Ville Helin. Linked using WLALINK Z80 WLA Macro Assembler Linker v5.7, written by Ville Helin. Custom tools synthesized from the luminiferous aether as per requirement. Many thanks go to the denizens of SMS Power, without whom this game would not have been possible. Fusion (Fusion364): The Straightforward One. Mednafen (mednafen-0.9.28-wip-win32): The Stark One That Does Rewinding. MEKA (mekaw073, mekaw80): The One With The Cool Debugger. Emukon (Emukon 1 05): The One That Simulates VDP Access Time Requirements. Neither the name of the author nor the names of the contributors may be used to endorse or promote products derived from this software without specific prior written permission.